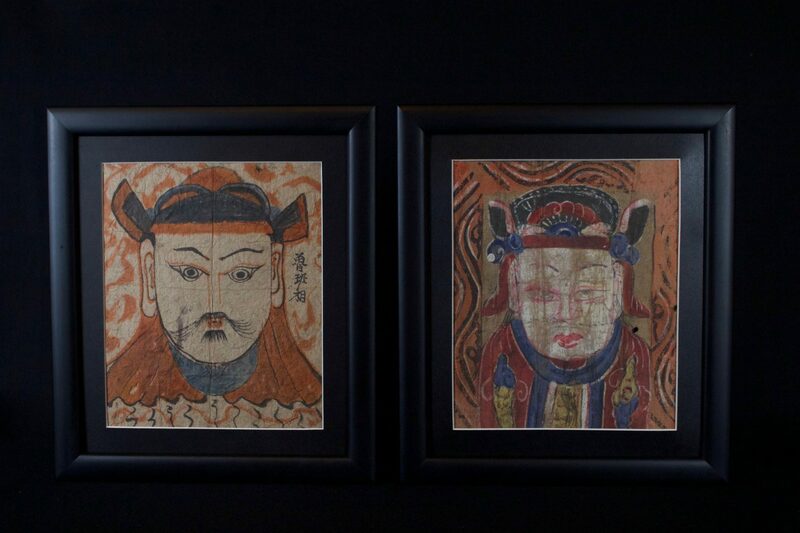 Shamans derive spiritual power from these paintings. When hung around the room in specifically arranged layouts, they effectively become the spirit world they represent and, like a portal, the shaman can then enter that realm. 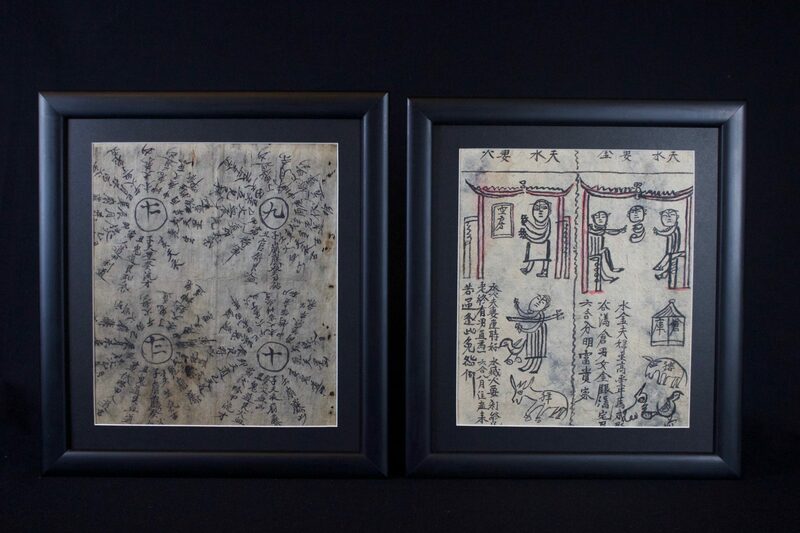 The ritual texts allow him/her to communicate directly with the deities and ancestors to negotiate and treat diseases and other things that have become out of balance. 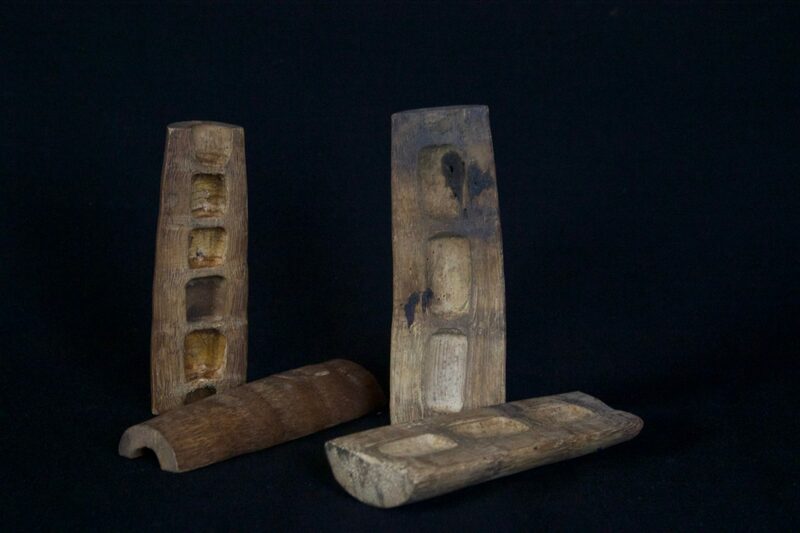 An essential set of three basic painting panels is the minimum requirement for a a newly initiated shaman. 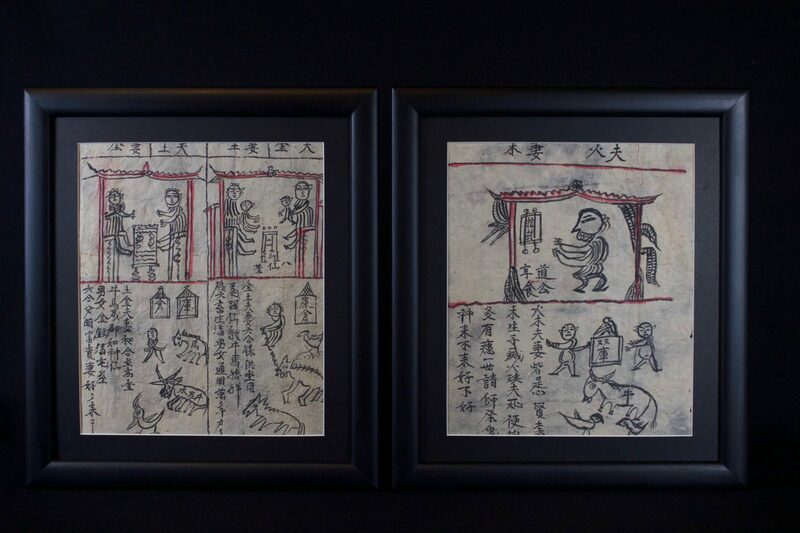 Full sets, required for many rituals, can range from 17 paintings to more than 27. 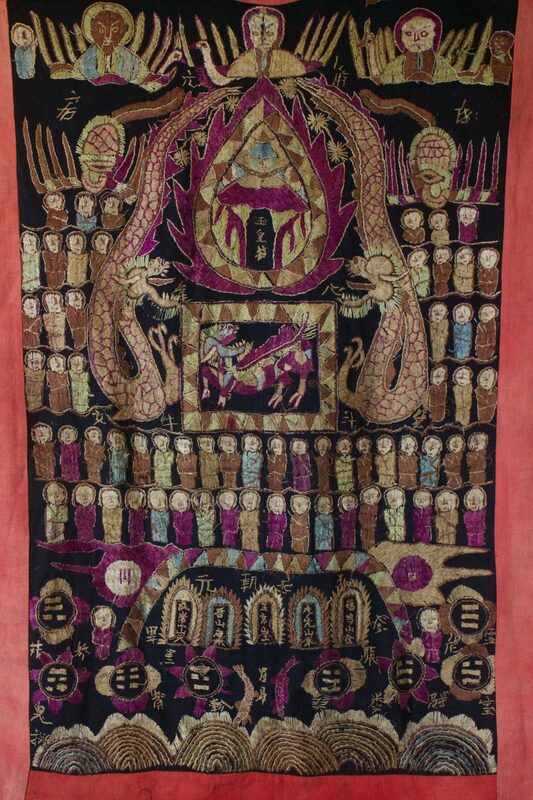 An example of a ritual requiring a full set would be one performed to liberate souls of the dead from Hell to be reborn into Heaven. 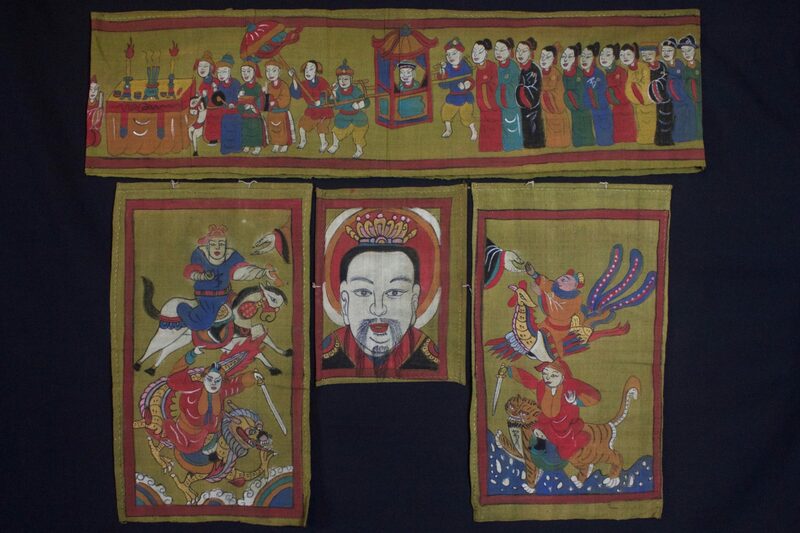 The panels depicting the 10 Kings of the underworld are hung around the main room of a house. The shaman enters a trance, thereby entering Hell, and chants a ritual that will save the soul of the recently dead. 42” x 16” (18 pcs), $7500. Or $425 for a single individual banner. Please ask us for detailed images of each of the banners. In addition to the previous set (previous image) of 18 large paintings – these are 3 smaller sizes – (3 pcs – 17 ½” x 10″, $170 each); (3 pcs – 10 ½” x 7 ½” , $110 each); (1 piece – 9″ x 80″, $325.) The horizontal one is shown folded. Please contact us for additional images. 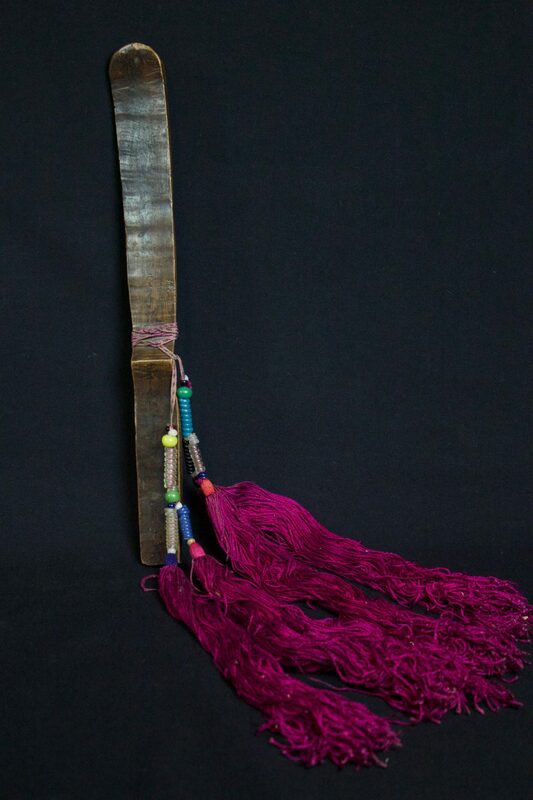 Potent tool used similarly to a Himalayan Phurba, to direct evil energy away and to summon and control spirits. Text characters are painted onto all sides. 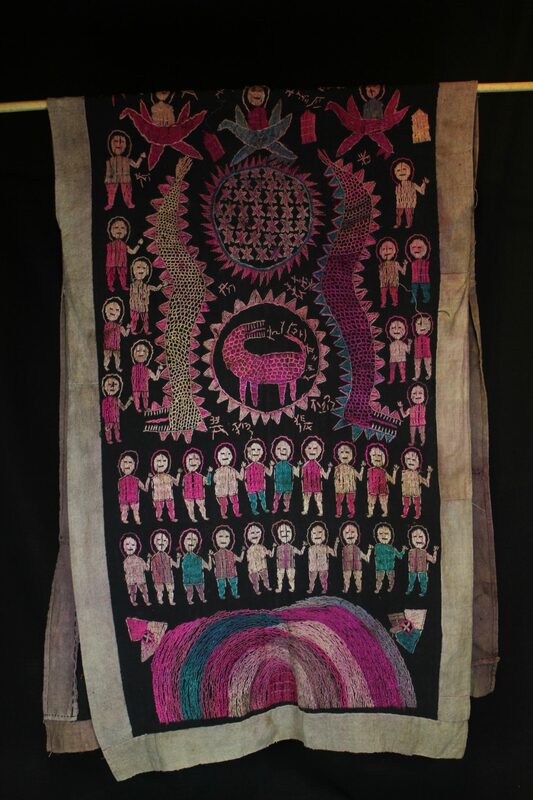 13 ¼” x 16 ½” x ¾”, $650. (49” x 42” robe); (35” x 26” skirt); (106” x 3” belt); (118” x 9 ½” scarf – below), $3900 full costume. Hats are a crucial part of the shaman’s costume. Hats made from human hair are worn only by high level priests. Postulants and newly ordained shaman wear a cotton and silk head scarf. Human hair strands are twisted together to make thicker ones, dyed dark brown and woven into patterns. 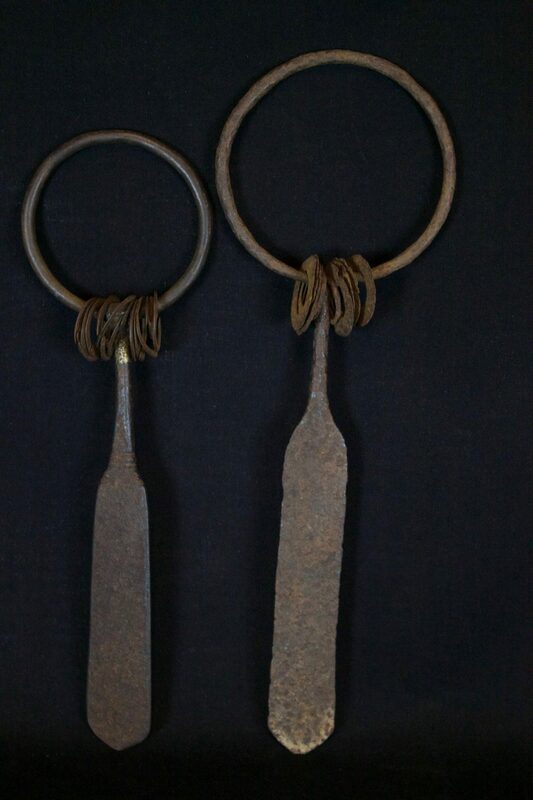 They are very difficult to make but are durable and last a long time. The symbol for good luck symbol is woven into the front of the hat and the shaman’s name into back. 9” x 10” x 2”, $675. 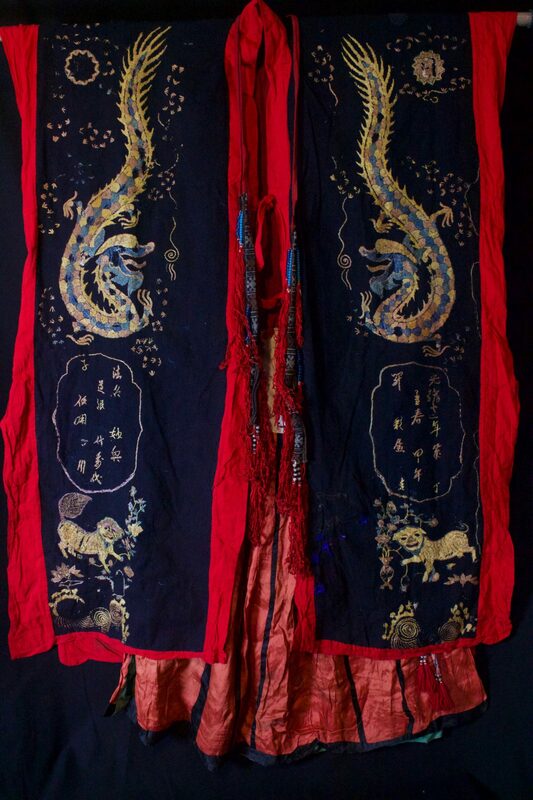 Dragon Robe Ritual Costume, Front view of previous Robe. 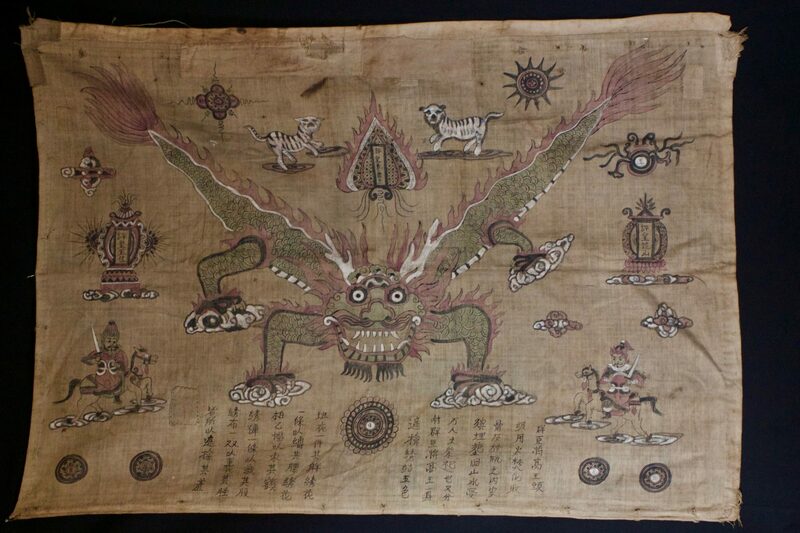 Pan Hung is a Taoist mythical, composite beast, usually a varied mixture of Dragon, Tiger and Dog. This particular wand is dominantly Dragon. 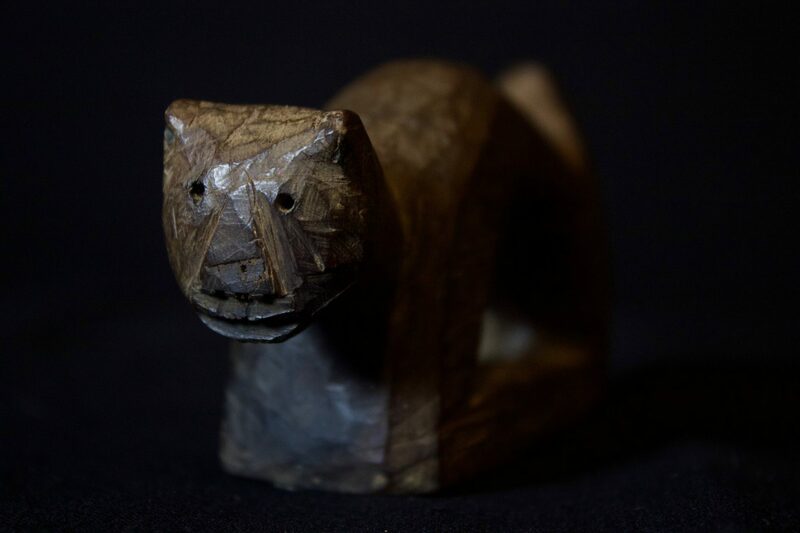 It is typically used for calling spiritual powers and for fending off evil spirits – especially at funeral rites, and to wave over items to be burned as offerings to the ancestors. The slot on the underside is for mounting on a wall when not in use. 3” x 1” x 8”, $375. 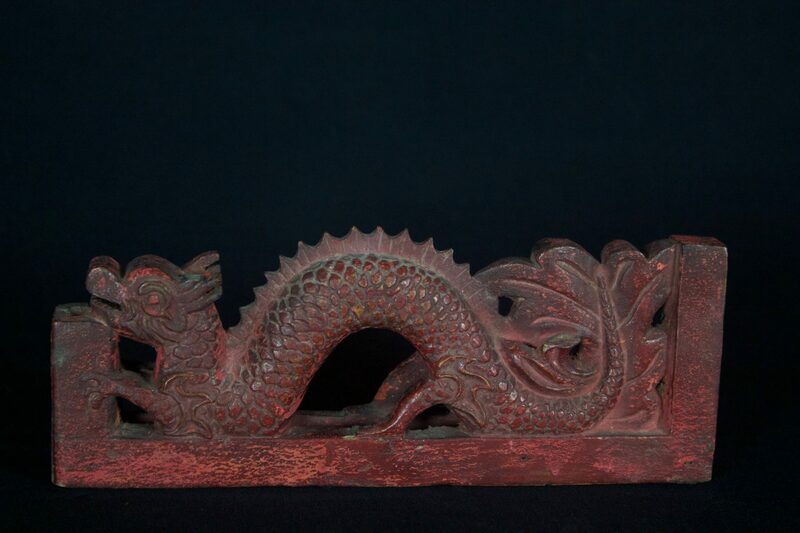 Pan Hung is a Taoist mythical, varied, composite beast: Dragon, Tiger, Dog. 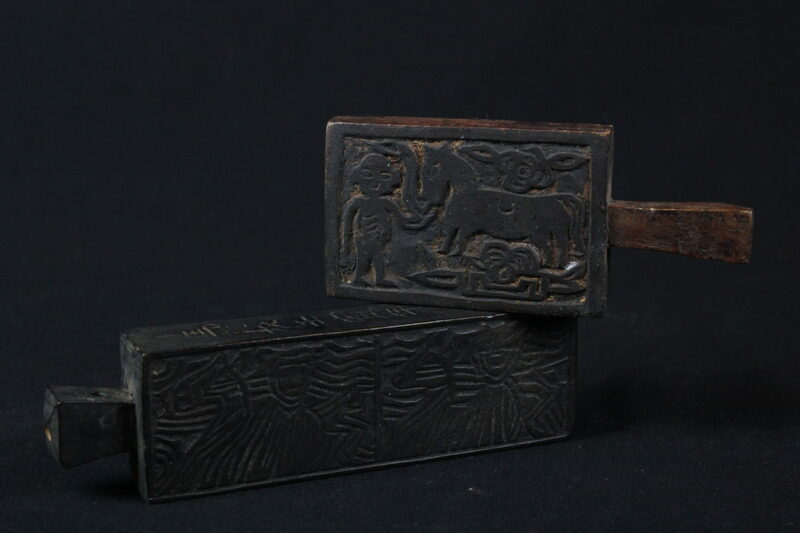 It is typically used for calling spiritual powers and for fending off evil spirits – especially at funeral rites, and to wave over items to be burned as offerings to the ancestors. 2 ¼” x 1 ¼” x 4”, $190. 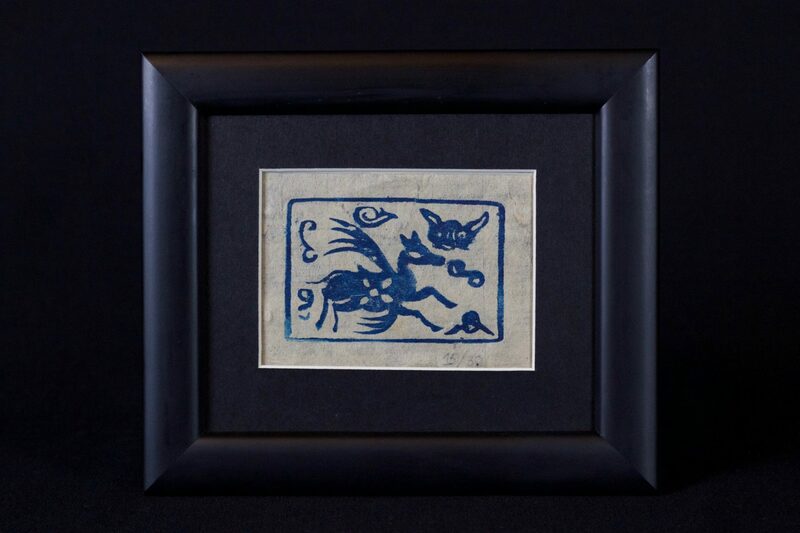 Pan Hung is a Taoist mythical, composite beast: Dragon, Tiger, Dog. This particular wand is dominantly Dragon. 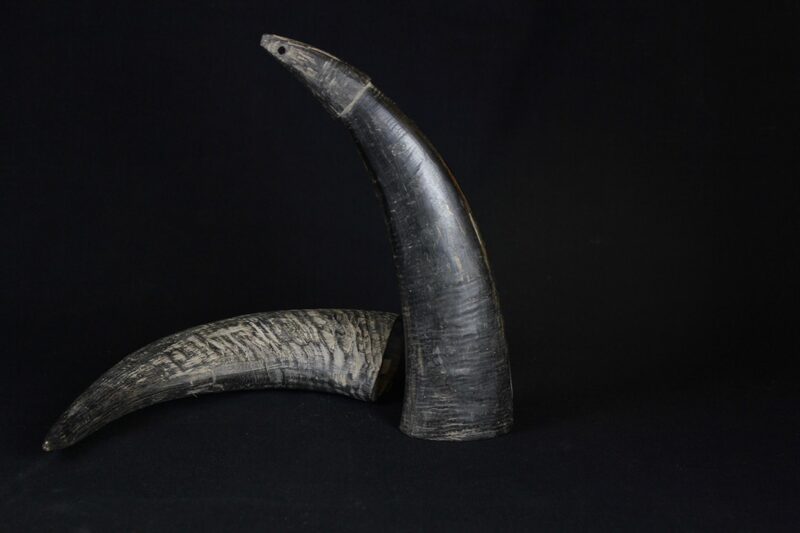 It is typically used for calling spiritual powers and for fending off evil spirits, especially at funeral rites, and to wave over items to be burned as offerings to the ancestors. The slot on the underside is for mounting on a wall when not in use. 3 ¾” x 1 14” x 18”, $800. One of the four sacred animals, the unicorn symbolizes purity, happiness and wealth. If the unicorn appears, many good things will happen. 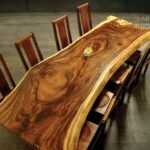 It is often hung over the altar table in pagodas, temples or in homes of traditional families. Its strength and faithful nature are desirable for guarding temples and places of worship. Almost all of these pieces from this time period are portrayed in blue, cream and metallic color schemes. 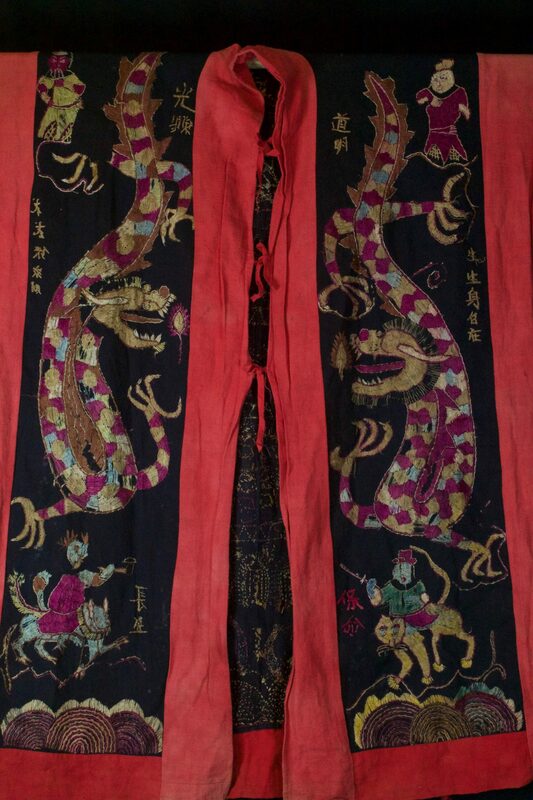 Because of its coloring, this panel is unusual and particularly desirable. 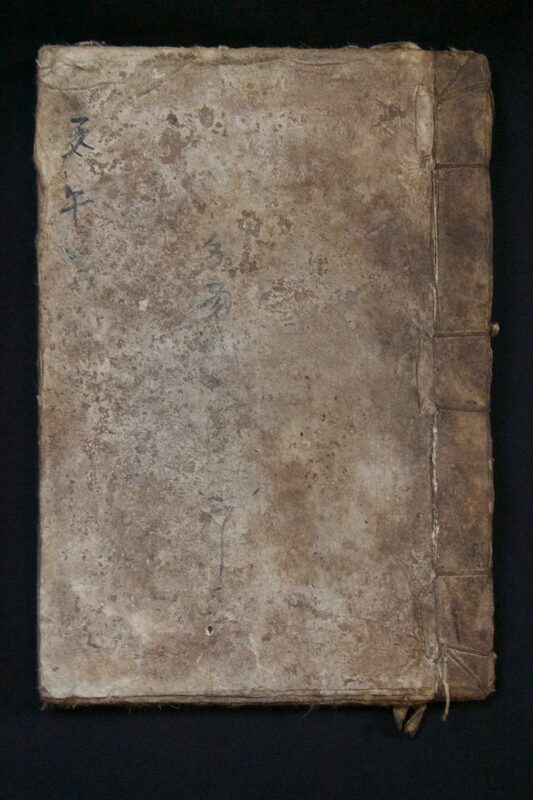 15 ½” x 17 ½” x ¾”, $590. 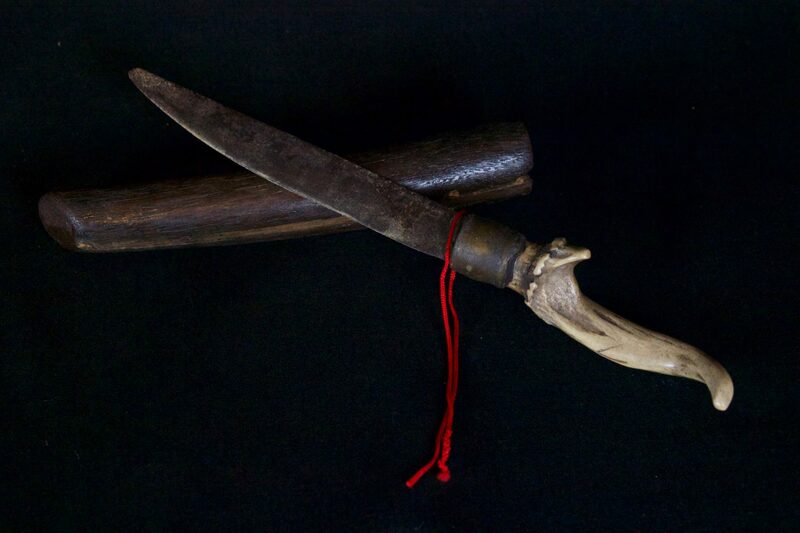 Kept in a Shaman’s home. 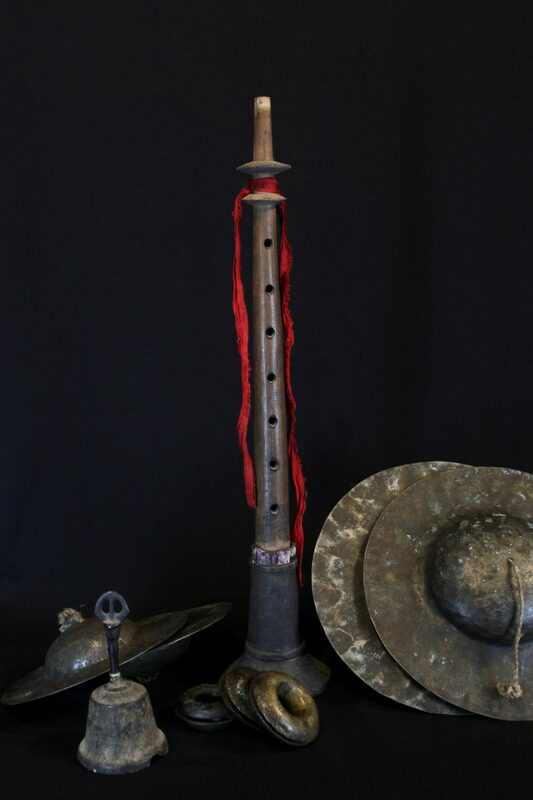 Part of the items required to contact the spirit world. 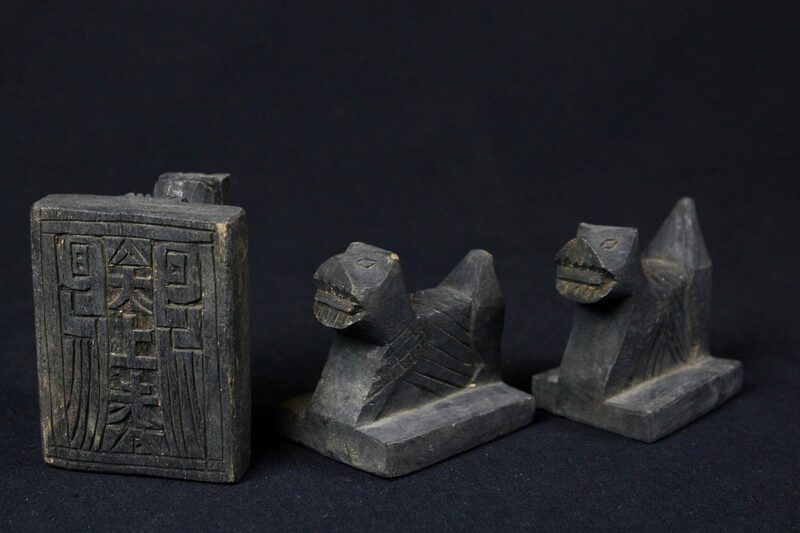 Every shaman has a set of three ‘Zhu Zhong Fan’ figures. 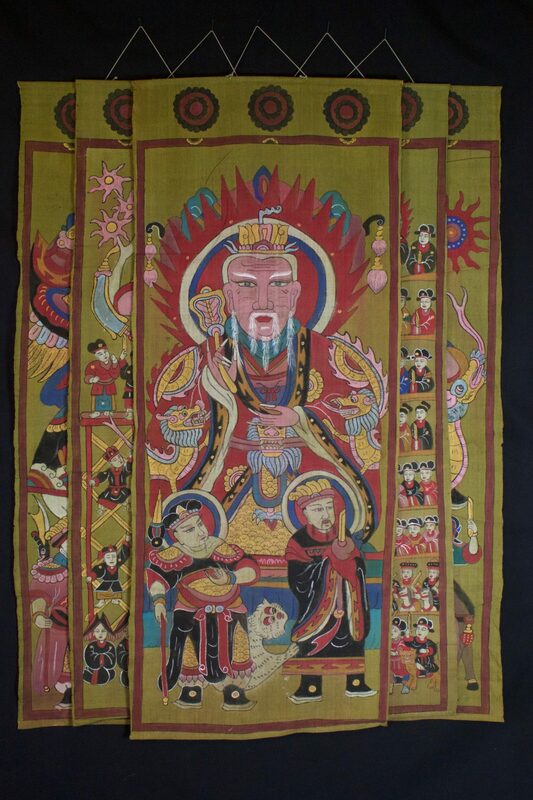 They are: ‘To Sai’ – an ancestor shaman priest figure; ‘Nyut Hung’ – a seated Mandarin or God figure; and ‘Khong Zhao’ – a protecting officer or messenger to the gods. He is always mounted and brandishing a sword or pennant. They are only sacred once they are gifted with a soul. 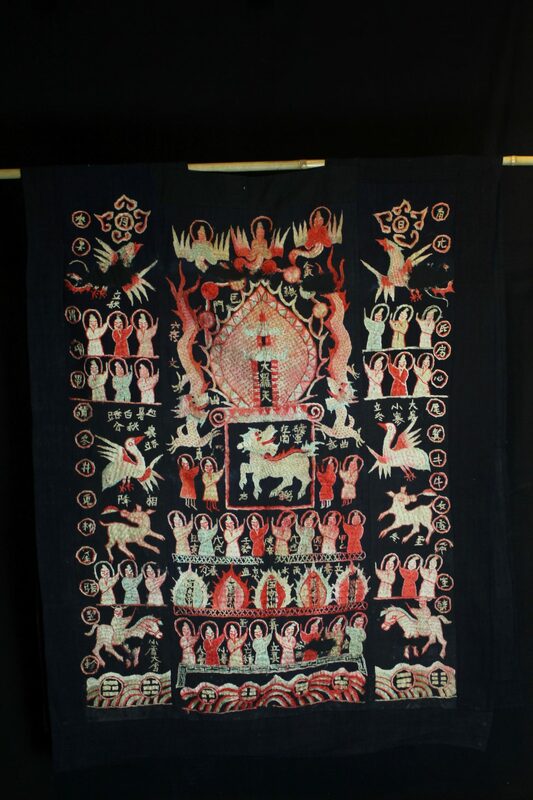 A ceremony is performed calling for the deity or ancestor to enter the figure. 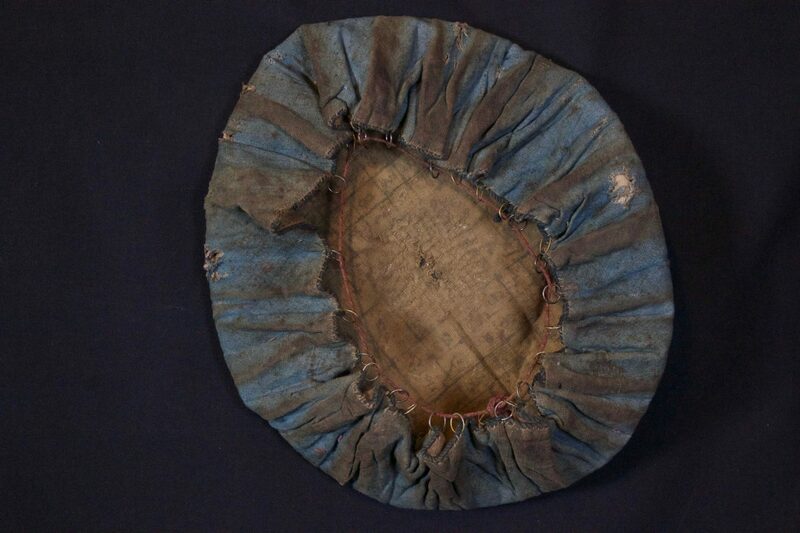 A piece of silver and some threads are placed in a secret hole in the back and sealed up. This is where the soul resides. 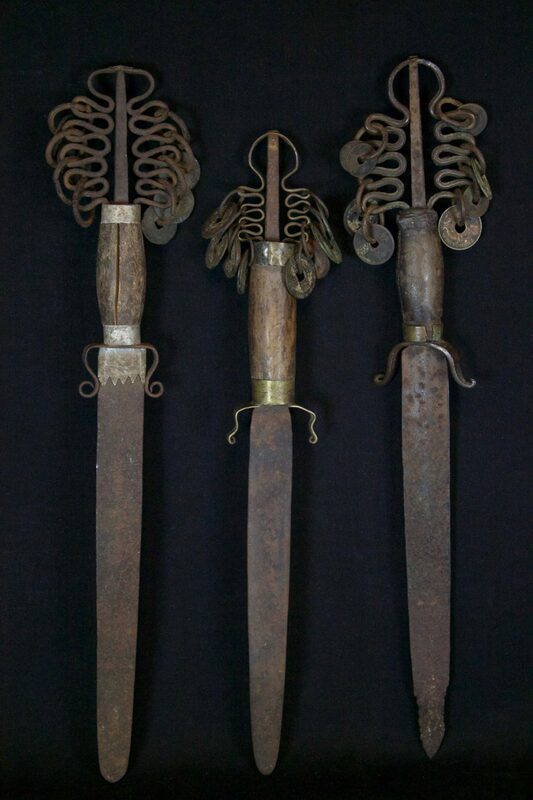 When the figure is given away or sold the silver is removed rendering the figure inert and no longer sacred. 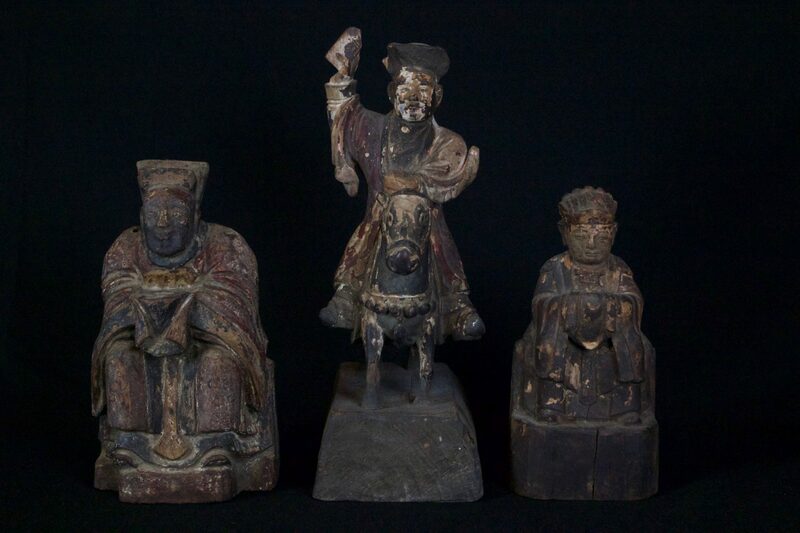 (left – ‘Nyut Hung’ figure, 8” x 4 ¼” x 2 ½”, $650); (middle – ‘Khong Zhao’ figure, 11” x 4” x 6 ¾”, $900. 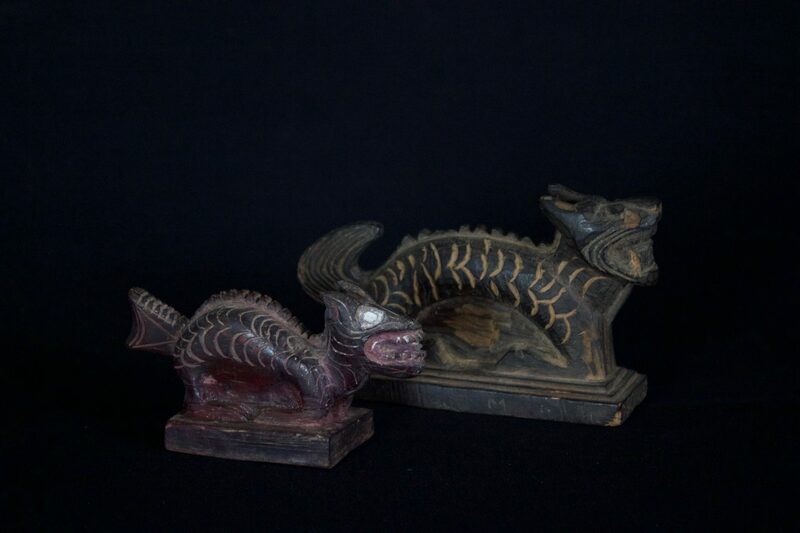 ); (right – ‘To Sai’ figure,7” x 3 ¼” x 2 ½”, $650). Worn only by high level shaman. 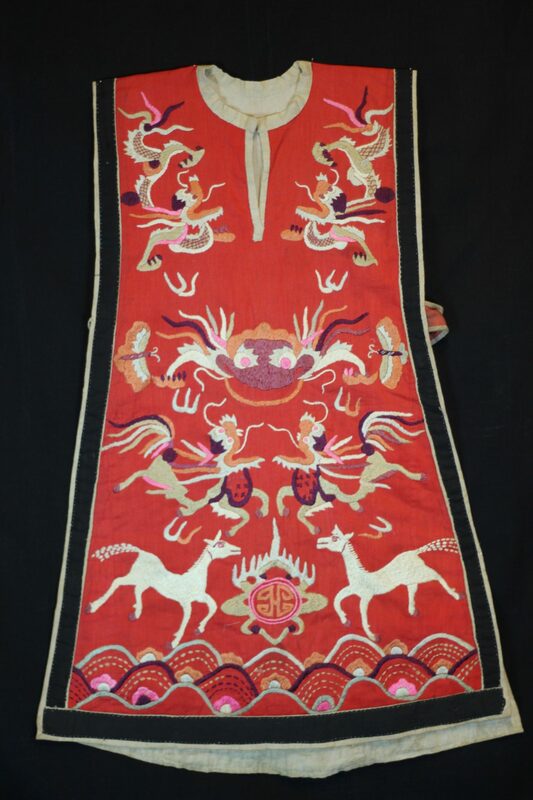 The motif typically includes all the deities of heaven to clothe the shaman in the protection of the universe. Not a vain adornment, it is a reminder of man’s place in the hierarchical order. Originally a female costume. Long ago shamans were women and men the providers. 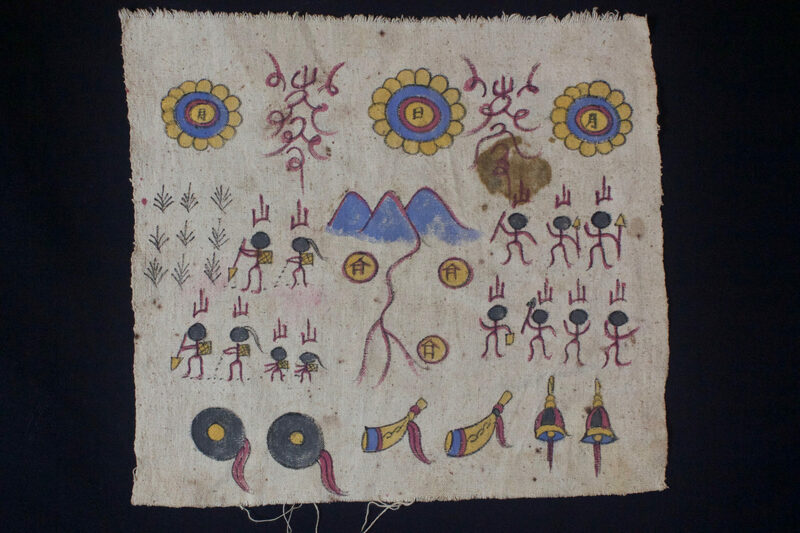 Not being encumbered by childbirth and rearing, men replaces women as shamans but retained this part of the sacred costume. *more information available. 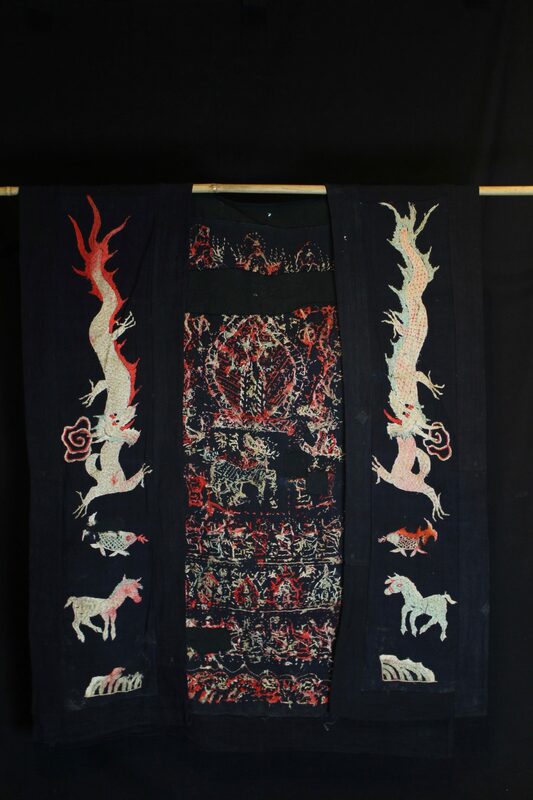 47” x 27 ½” x 3”, $3100. 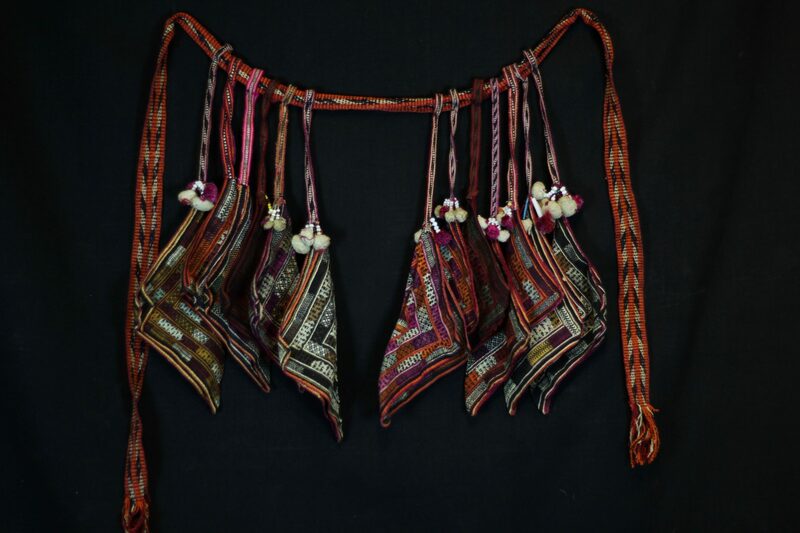 Worn by shaman while performing religious rituals. 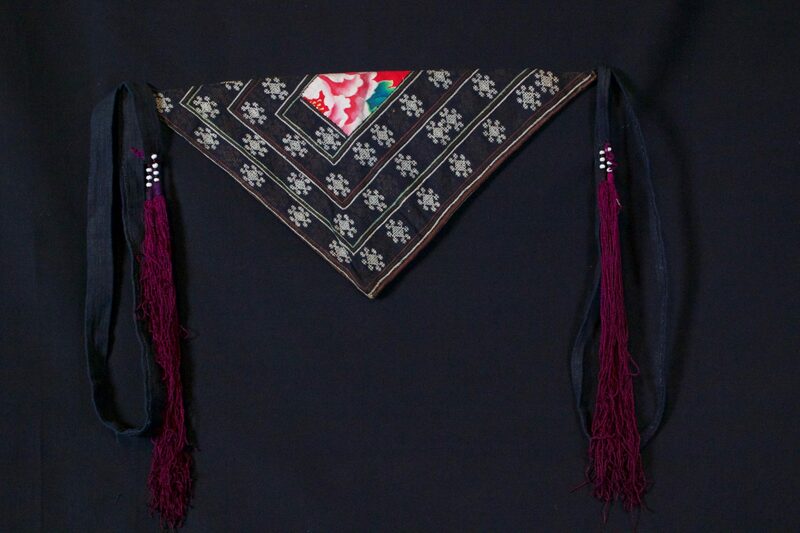 A complete belt would have a minimum of 12 handkerchiefs (embroidered squares). 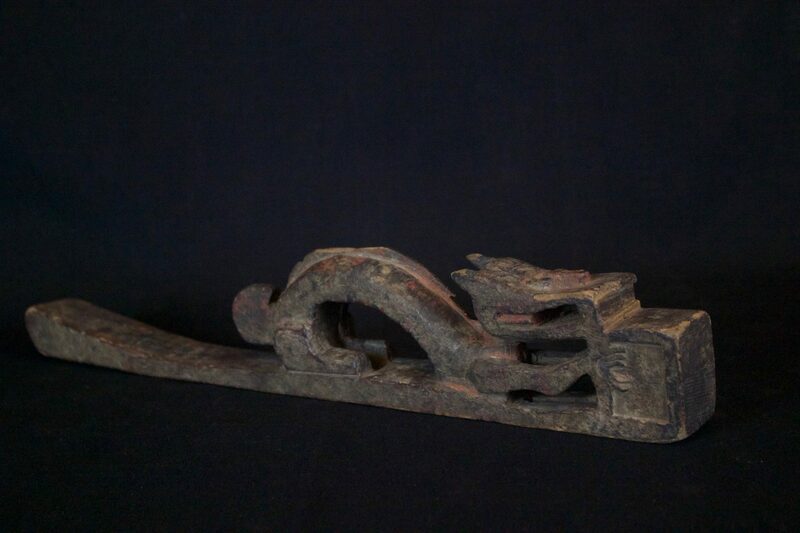 The belt is passed down through generations, revealing its history. 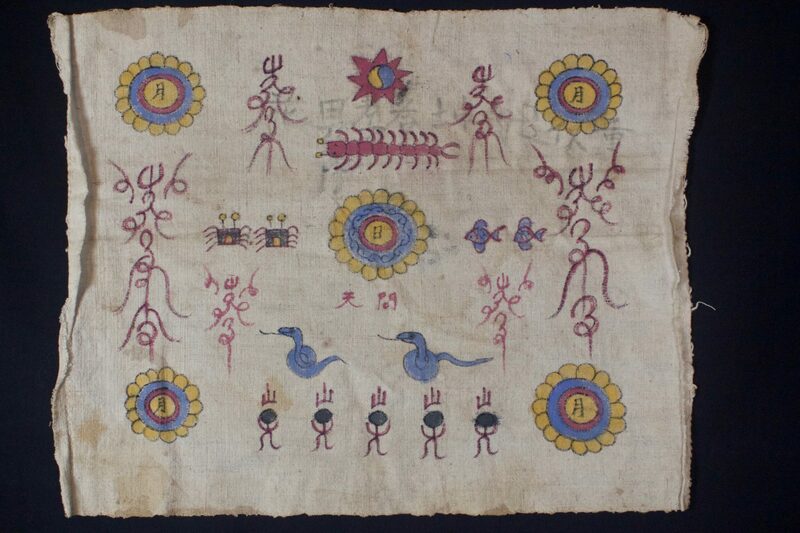 If a shaman has two sons or apprentices, he will spit the belt and the new shaman’s wife would make the other necessary handkerchiefs. Several generations are represented in this belt. 75” x 18” x 2 ½”, $775. 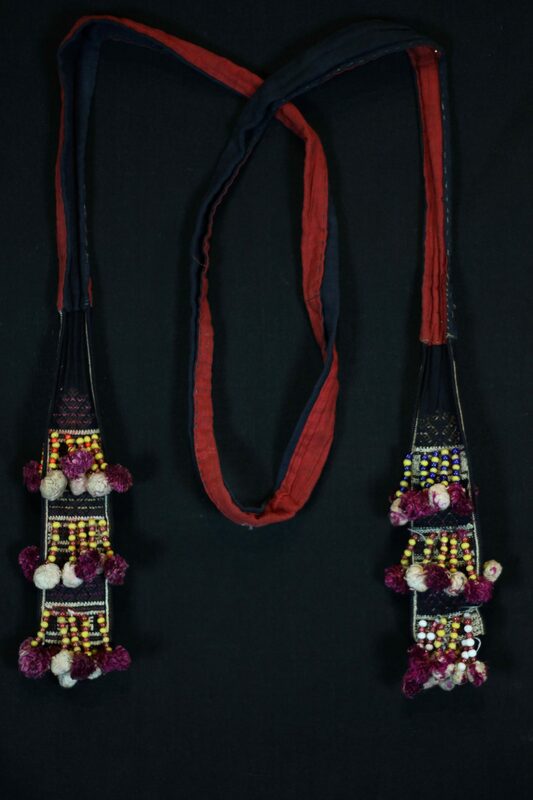 Worn by shaman while performing religious rituals. 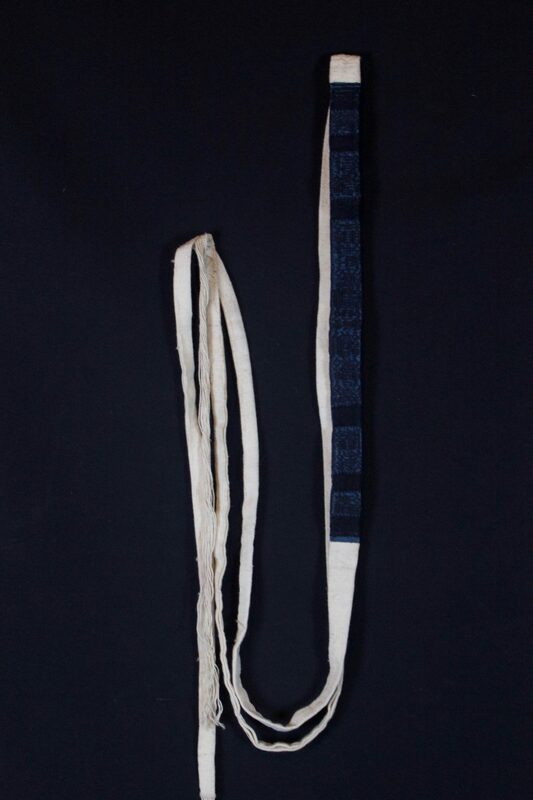 A complete belt would have a minimum of 12 squares (handkerchiefs). 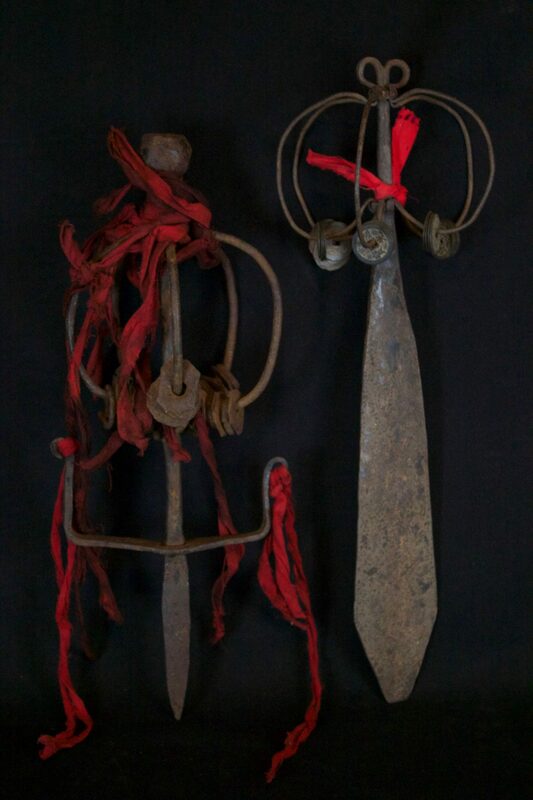 The belt is passed down through generations, revealing its history. $75. to $90. 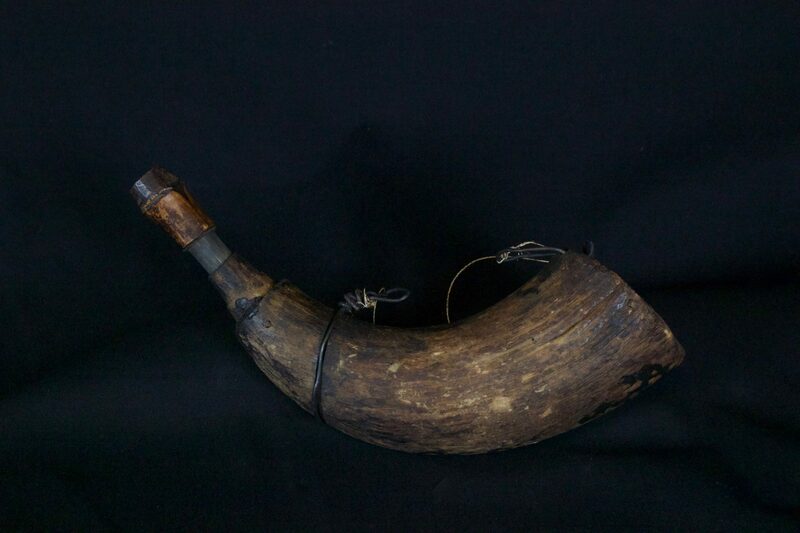 Used in sacred rituals. 10” x 1 ½” x 1”, $580. 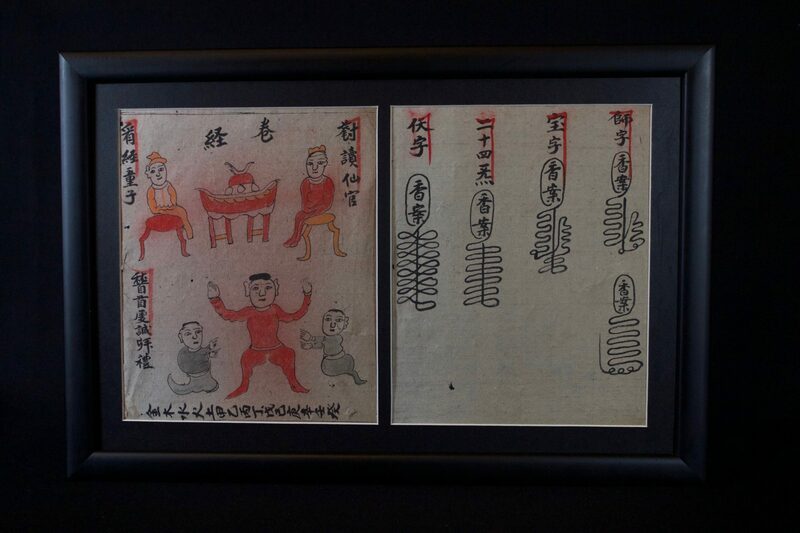 To carry medicinal remedies used in healing rituals, 10” x 4” x 2 ½”, $420. 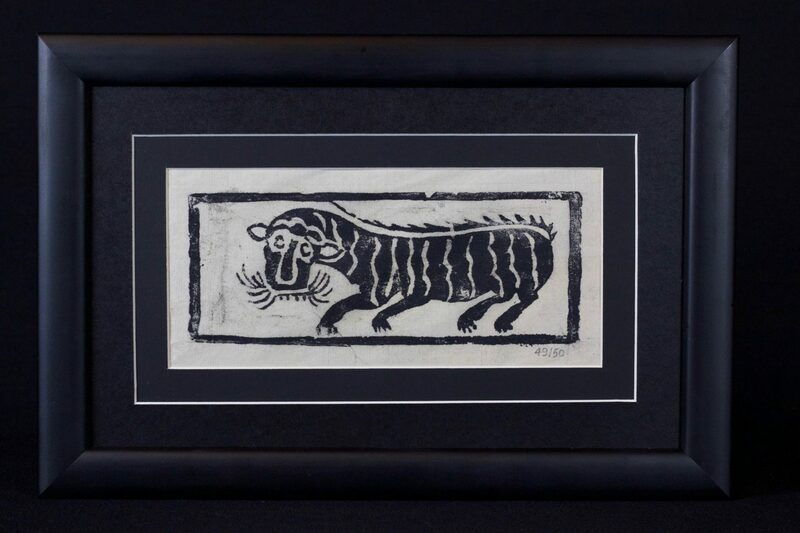 Shaman Printing Block, Tuyen Quang province, Vietnam, Mid 20th c.
Shamanic Print – Tiger, Vietnam, Dao Lo Gang people, Contemporary, Pigment printed on handmade ‘Do’ paper, 8″ x 12″ x 3/4″, $55. 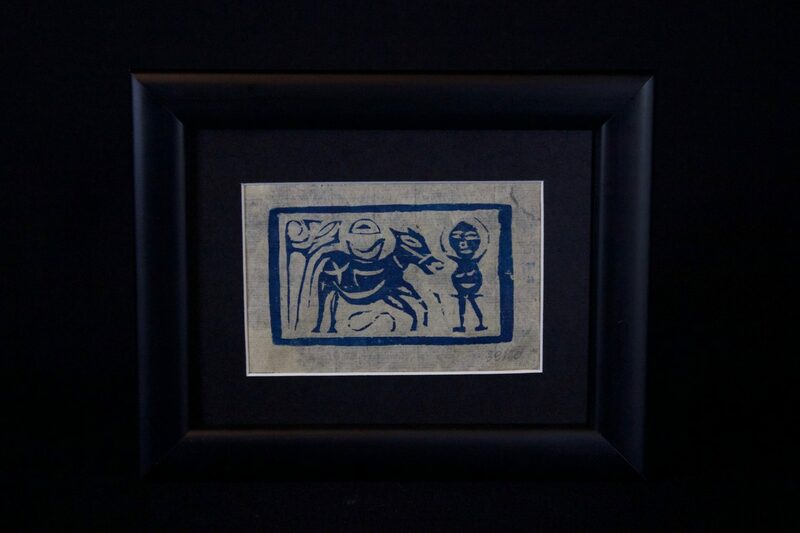 Shamanic Print, Man with Horse / Man with Bird, Vietnam, Hoa Binh province,Dao Quan Chet people, Contemporary, Pigment printed on handmade paper, 7″ x 10 3/4″ x 3/4″, $55. 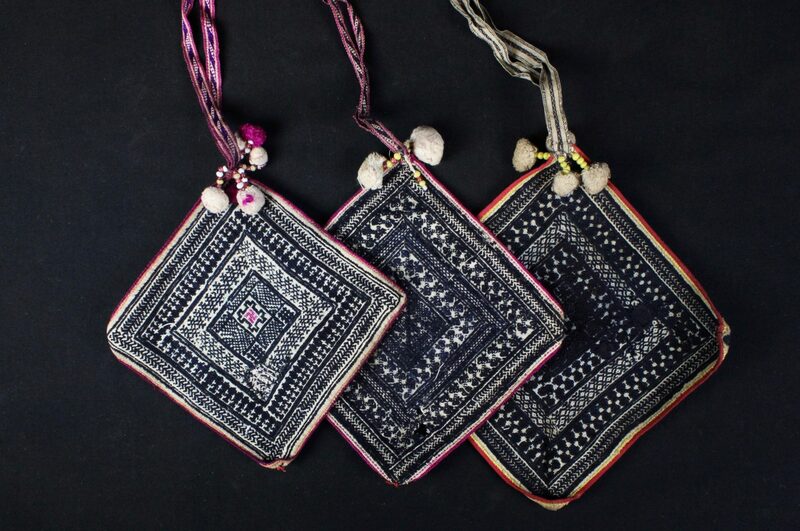 Shaman use a bag or purse to keep and carry magic ritual items. 8” x 15” x ½”, $70. 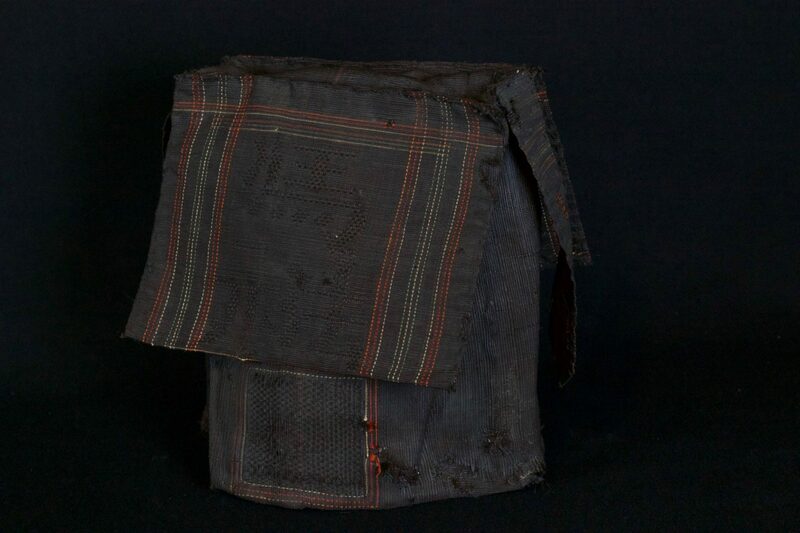 Bag or Purse to carry magic ritual items, 11” x 17” x ½”, $120. 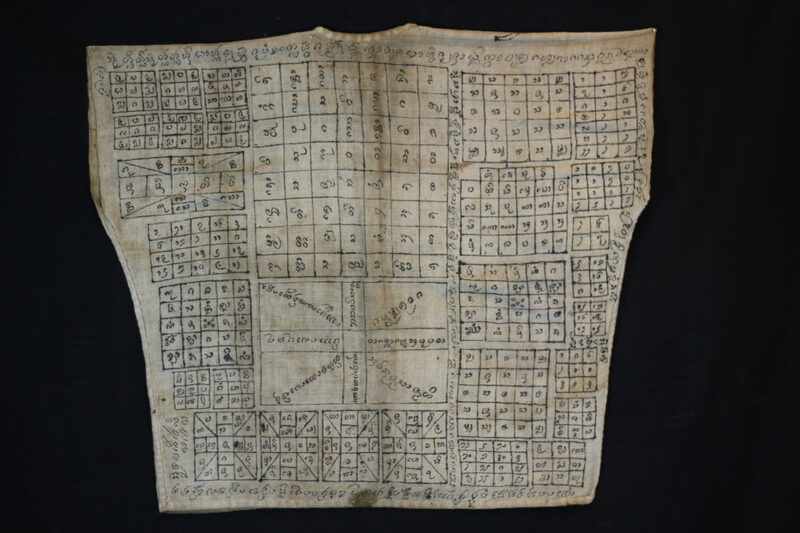 Shaman’s Amulet Cloth, Vietnam , Yao people, Early 20th c, Cotton with pigment, 13″ x 14′, $190. 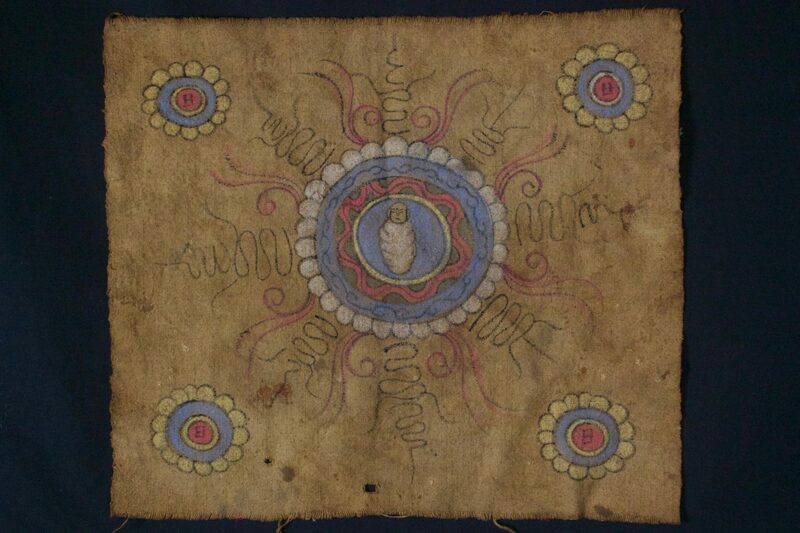 Shaman’s Amulet Cloth, Vietnam , Yao people, Early 20th c., Cotton with pigment, 13″ x 14″, $190. 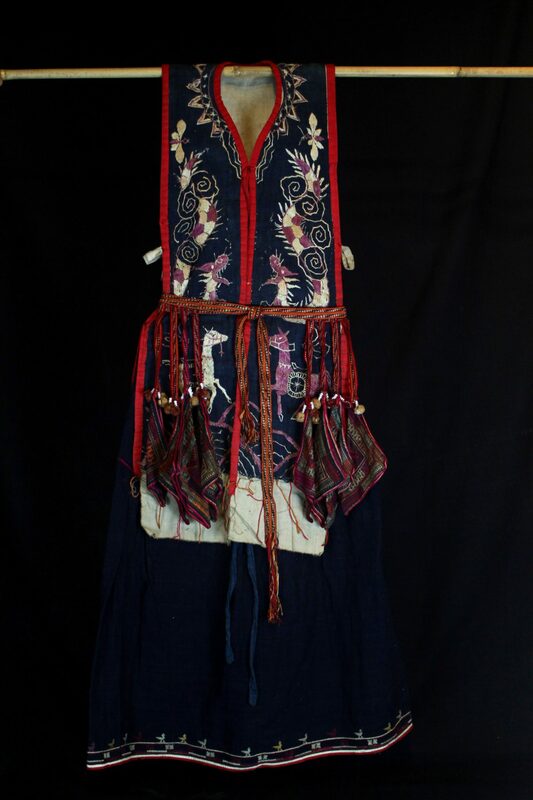 Part of shaman’s traditional ritual costume. 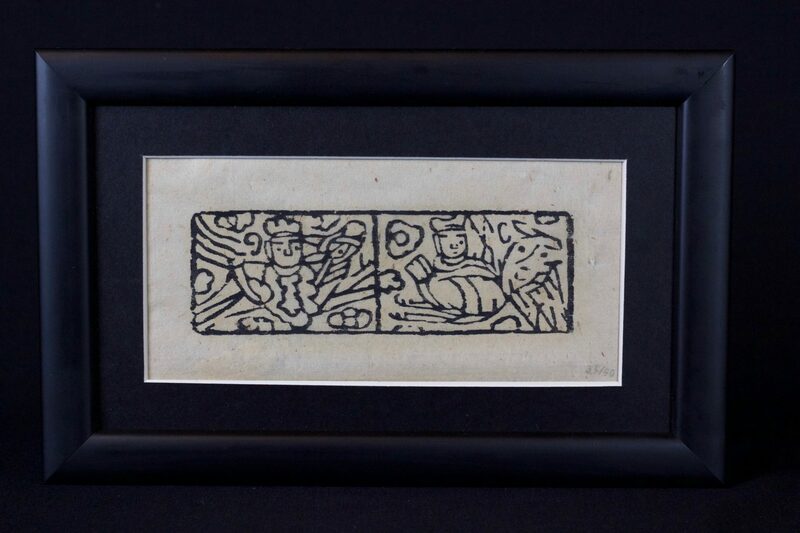 69 ½” x 3” x 1”, $180. Worn only by high level shaman. 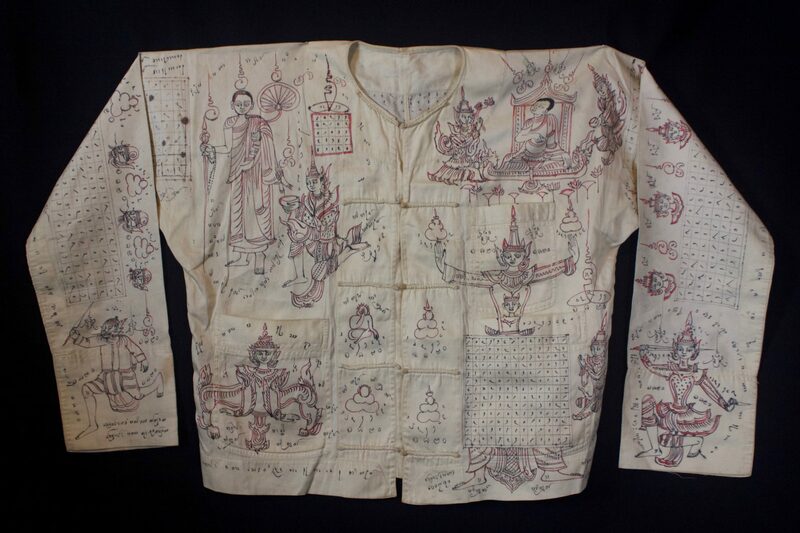 The motif typically includes all the deities of heaven to clothe the shaman in the protection of the universe. Not a vain adornment, it is a reminder of man’s place in the hierarchical order. 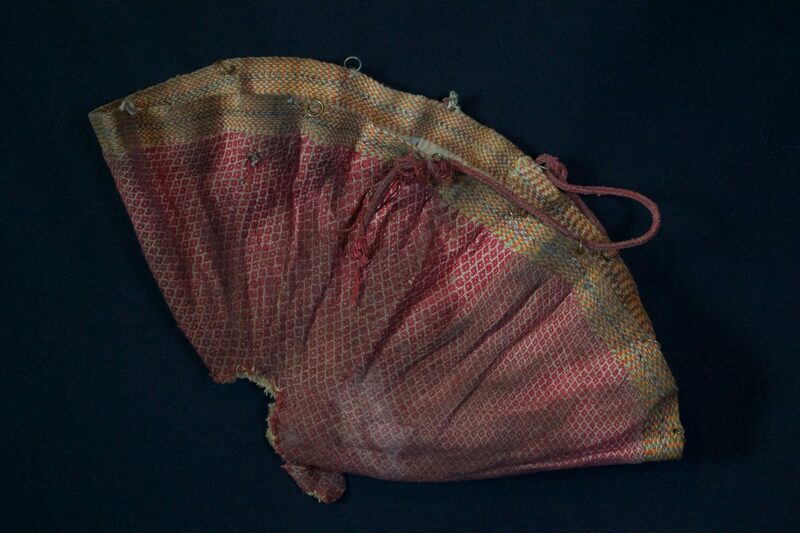 Originally a female costume. Long ago shamans were women and men the providers. Not being encumbered by childbirth and rearing, men replaces women as shamans but retained this part of the sacred costume. 34” x 24”, $2800. 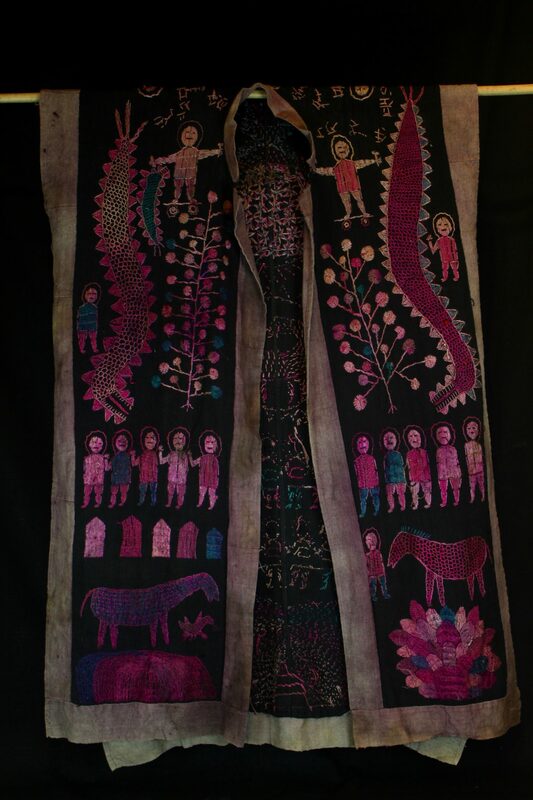 Part of shaman’s traditional costume. 110” x ¾”” x ⅛”, $30. 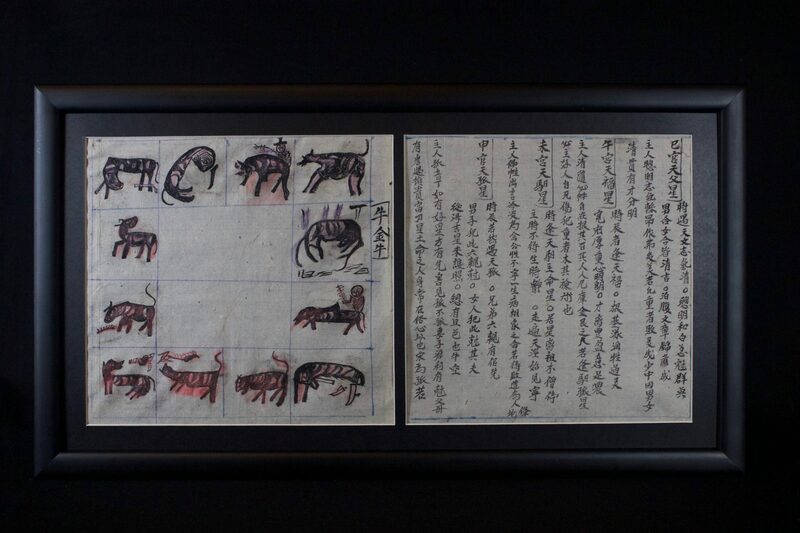 It is a book for making astrological predictions using the East Asian zodiac’s twelve animal characters. 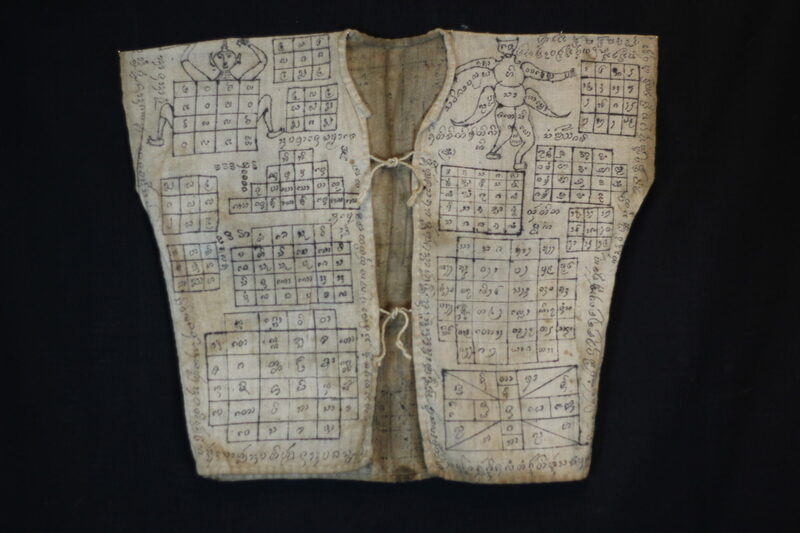 The text of the book uses images, maps and text to describe in detail, for the learned shaman, how to navigate this complex system of looking into the future. 12” x 17 ¾” x ¾”, $260. 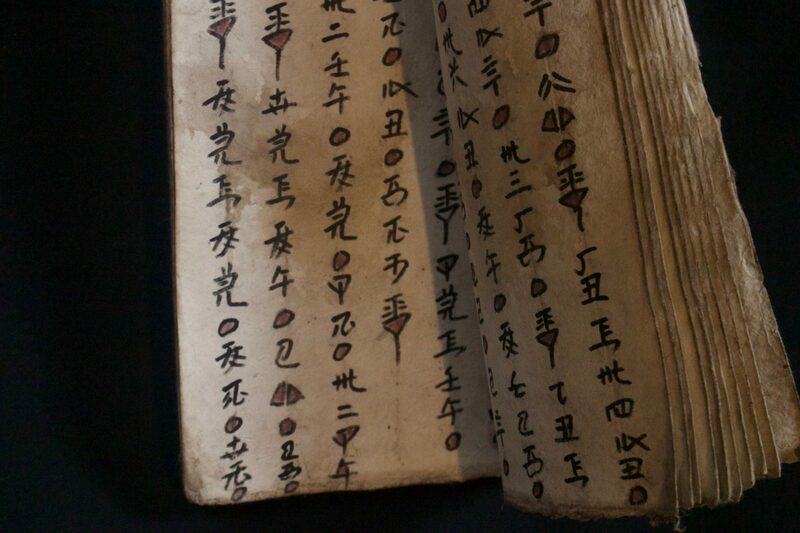 Written in Nom (Chinese characters adapted to Vietnamese), books are an integral part of a shaman’s repertoire. 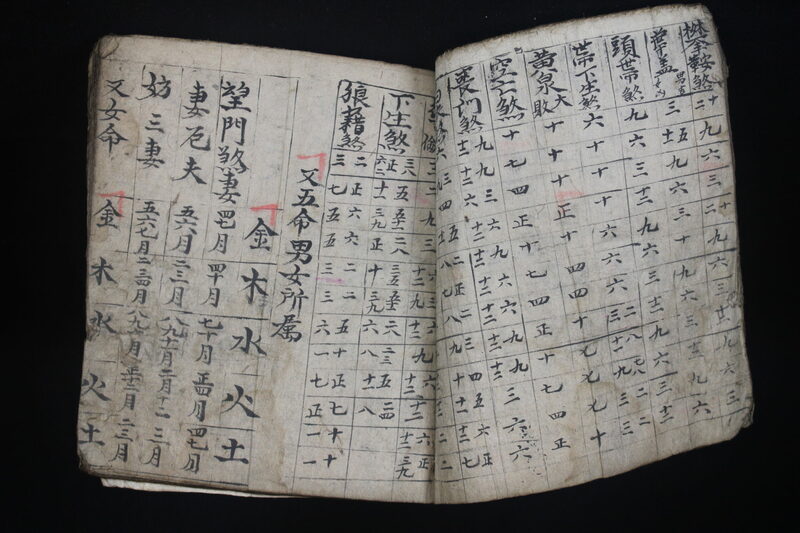 They range from explanations of various rituals and use of objects, to astrology, history, songs, laws, etiquette, children’s tales, hunting practices, formulas, spells and Feng Shui. 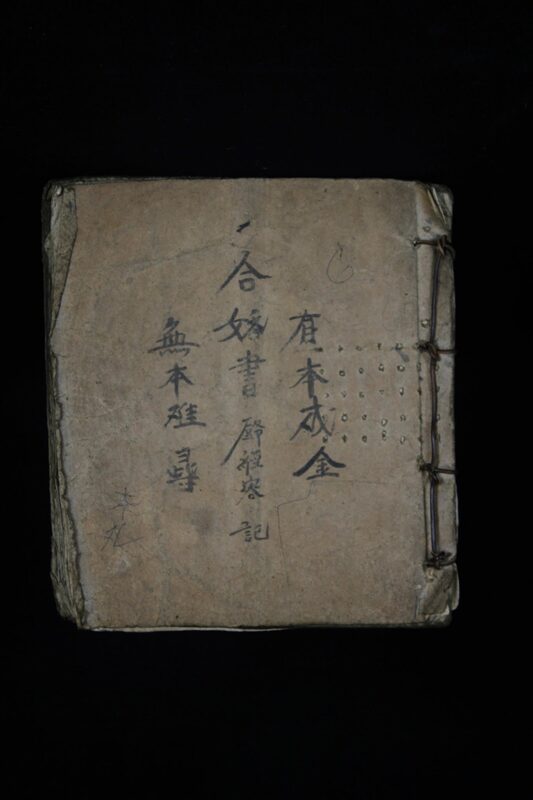 Shaman make their own books to help store their knowledge therefore no two are alike and a high level shaman will have a large library. 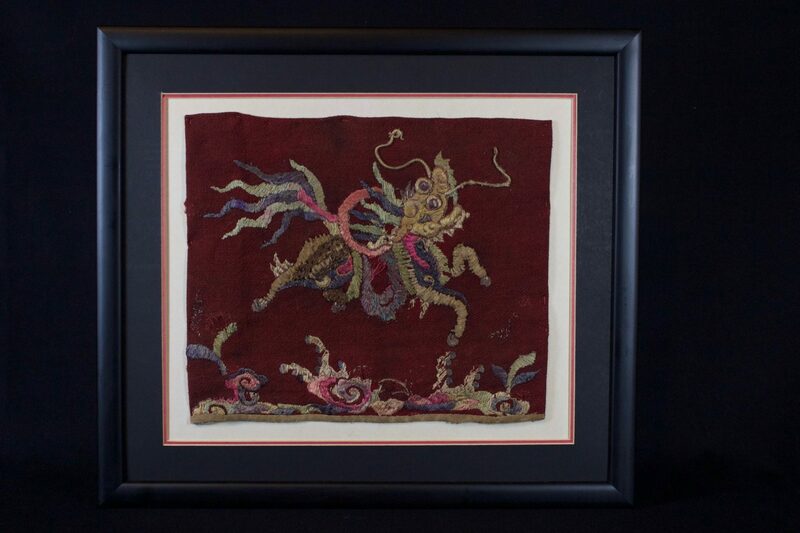 9 ½” x 8 ½” x ¾”, $850.